There are plenty of couples activities out there. This is largely because anything you do, but do as a couple, can be classed as a couple’s activity. Cooking…with your partner? Couple’s cooking! Dance lessons…with your other half? Couple’s dancing! Playing games…with your date? You guessed it: couple’s game night. Or date night. Couple’s game-date-night. Whatever. You know what we mean. In our absoluuutely unbiased opinion, we feel board games are one of the best activities you can bring to game-slash-date night. They may not have the glamour of a five-star restaurant, or the sensuality of a salsa dance class (shocking, we know! ), but they more than make up for it in their variety. Each tabletop game out there brings something new to the table(!!) – some bring you the opportunity to work together, others to compete; some are perfect for laid back date nights, whilst others absorb you completely in stealthy strategies. Rest assured, there are games to fit different games nights, and games to fit different couples. So, with Valentines Day coming up, we thought we’d suggest our top 5 tabletop games for couples to play – or, to be honest, for any pair of players who want to have some fun. Read on to find the next new game you and your partner should play! Fog of Love is a unique and wonderful game about navigating the intricacies and challenges of a relationship. Now, you may be thinking: why would I play this as a board game, when I have the real life simulator – aka, being in an actual relationship! To that we’d say that Fog of Love brings up relatable reflections of many different types of people and relationships with grace and humour. It’s equal measures amusing and thought-provoking. In Fog of Love, you and your partner play as two fictional characters, each with their own occupation, traits, and consequent desires. Each character is looking for happiness, to fulfil their destinies and to feel satisfied with their relationship…so surely, as these characters form a couple, these objectives indicate it’s a coop game, right? … Right? Well, not quite. As we’d mentioned, each character has their own goals, traits and destinies they envisage for the relationship. But these are largely secret, and don’t necessarily align with those of the other player. Perhaps one character is placing their bets on a relationship of unconditional love, whilst the other is eyeing one where they’re the dominant partner. You can see whilst you may want things to work out for both, this may not always end up being the case! You and your partner will go through different ‘scenes’ together, which in turn make up the ‘chapters’ of your characters’ relationship. In each scene, either both or one of you will need to make a decision. Some are more sweet and lighthearted, like choosing what to whip up for breakfast in bed (awww). Others are less easy – what if you’ve been married before meeting your current partner…and never told them before (ahhh)? The outcomes of each of these scenes affect your characters’ satisfaction and personality dimensions, which in turn affect how close they are to fulfilling their secret destinies. As you may have gathered from this description, these fictional characters can reveal surprising insights into real life relationships, even if it’s not necessarily the one you’re in right now. For couples that feel keen to dive into some life-reflective gameplay with potentially gritty questions, this is the game for you. In return, you’ll be rewarded with gameplay that is equal parts humourous and poignant. As a game that celebrates and explores relationships in all their grime and glory, we had to include it on our list of couple’s games! Our second two-player game is Jaipur, a card game where you compete to become the Maharaja’s personal trader by proving your trading talents. In the game players start with their own secret hand of cards, which can either be goods (like leather or diamonds) or camels. There is also a set of visible cards in the centre which make up the ‘market’. Players can sell their cards to get tokens (which then translate into points), or trade their cards for those in the market to form bigger (and thus more lucrative) sets of goods. The person who finishes the round with more points gets a ‘seal of excellence’ token; the first to get two seals of excellence wins the entire game. Within these overarching rules are opportunities for strategy. Do you trade in more of your cards to improve your hand, but reveal more of your cards to your opponent in the process? Do you try and take all of the camel cards, which won’t necessarily guarantee you as many tokens, but could be useful for trading more secretly later? Do you wait to cash in your goods cards for tokens when they may be worth more, or quickly before the other player takes the best tokens? In most competitive games your decisions will have consequences that affect other players, but this is all the more clear in Jaipur. In this game, the decisions of you and your opponent move in tandem, like slotted jigsaw pieces. 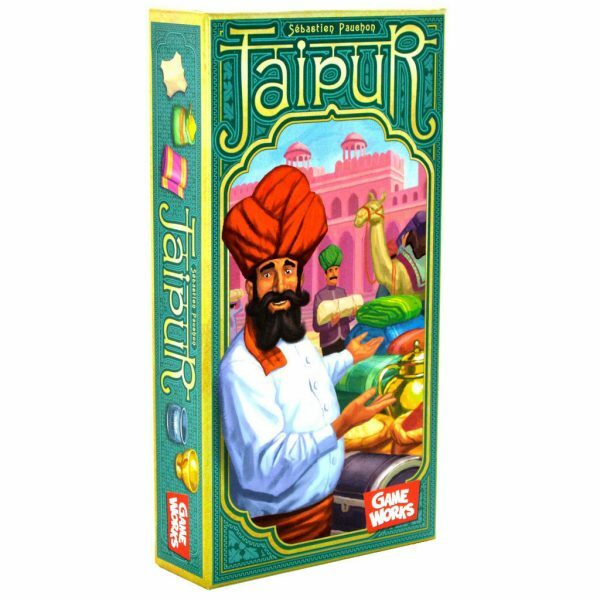 If you and your partner like a bit of competitive edge to your games, Jaipur provides it in a succinct and seamless way. 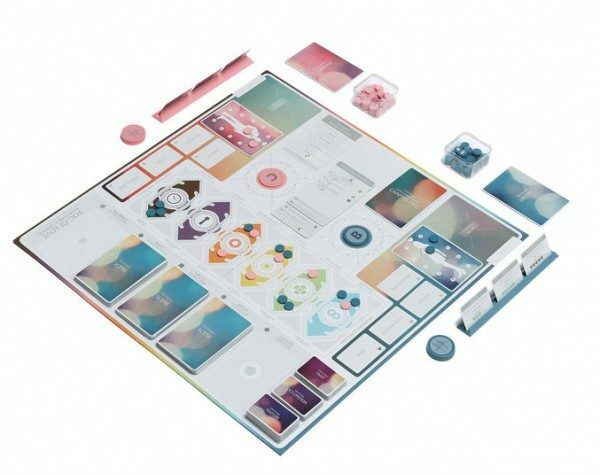 It’s also a great game for couples’ date night if one of you isn’t very familiar with tabletop games. Although there is space for strategy as we’ve highlighted, the rules of the game are easy to pick up. Combined with an element of luck depending on the cards you’re dealt, this gives both of you a chance to get to grips and stand a chance of winning. Now, this game is one of our own, but we really do think it’s earned its place on this list! 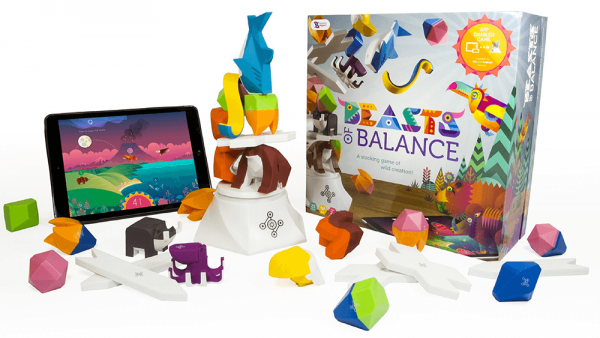 Beasts of Balance is a cooperative stacking game that mixes tabletop and digital play. Every physical piece you scan and place on your tower has an effect on the digital world you’re creating in the companion app. If you scan and place a shark, you’ll get a shark in your digital world! If you play a cross to combine two creatures, you’ll get to see just what that peculiar creation is in the app. Together, you need to work to get everything on the tower, whilst trying to get the highest score in-app as possible. So, why is this a good game for couple’s game night? For us, it’s about the flexibility that Beasts of Balance provides. The stacking is something that anyone can get into pretty quickly, so if you simply want a laid-back evening, you can happily play Beasts of Balance as an explorative game, experimenting with stacking styles and seeing what sorts of weird and wonderful creatures there are. Alternatively, if you want to get more strategic, the game also lends itself to focus. Although it’s easy to pick up stacking and the general rules of the game, it’s tricky to master – so you and your partner can just as easily work together to try and figure out which pieces are best to place when, and how exactly you’re going to coordinate your stacking skills. Additionally, the number of players for Beasts of Balance is flexible. Whilst two players is a sweet spot, playing with 1-5 players is also very doable – so there’s plenty of other opportunities to get this game off the shelf outside of couple’s time! As with Jaipur, Beasts of Balance is also a game that lends itself well to couples that are newer to tabletop games. Having the app takes care of any calculations you may have had to do in a more traditional board game. And even for seasoned board game players who don’t shy away from math (we bow down to you! ), there’s something a little magical about seeing digital manifestations of your physical actions – it really does feel like you’re creating a new world, and bringing it to life. So, for a game you can bring out for different occasions and moods, we’d recommend Beasts of Balance. P.S. 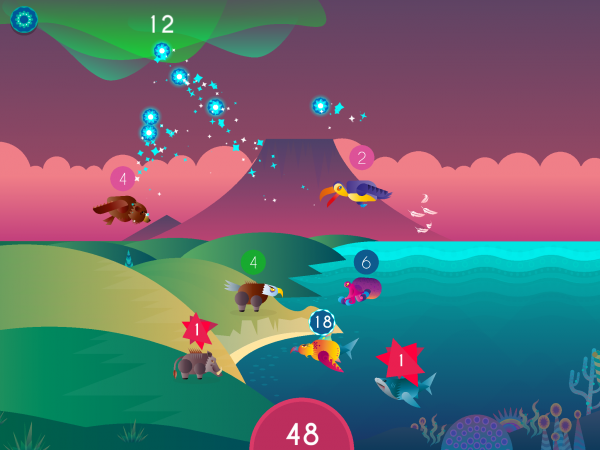 Like we mentioned earlier, Beasts of Balance is a cooperative game. But if you prefer a game where you don’t need to…partner…with your partner, there’s a competitive expansion on the horizon: Beasts of Balance Battles. It has all the adorable animals of Beasts of Balance (plus a few more exciting additions like a *dragon* and a *unicorn*), but with a little extra bite to it. Expect a lot of gleeful treachery, if you go for this option. If you’re curious, you can find more info here. Perhaps, quite reasonably, you read the title of this game and thought should I really be playing a game with ‘horror’ in the title on Valentines day? To which we would say…yes! 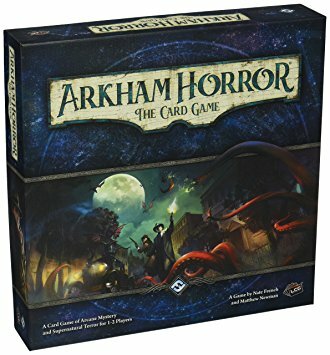 It may sound odd, but let us explain why the absorbing nature of Arkham Horror The Card Game is so great. All of these actions are played out with cards; essentially you and your partner are racing to get through the act deck, which progresses the story, quicker than the agenda deck – which unleashes more and more horrors upon your world. Throughout this process, you never know which card you’re going to draw from either deck, nor what is on the back of a card until it is turned over. This sounds obvious, but it keeps the sense of something eerie lurking in the shadows going throughout the game. It keeps you on your toes, and as a result, draws you in. It sounds strange, but this sense of trepidation is a large part of what makes the game so fun. 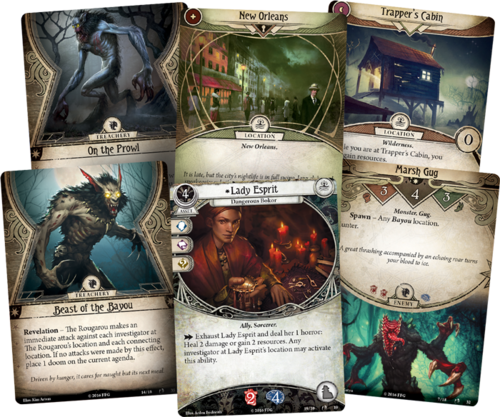 The other nice thing is that, despite all of the on-your-toes-ness that Arkham Horror TCG evokes, the narrative will still advance even if things don’t go as you’d intended. If you fail to defeat an enemy, the story still continues – it will just take into account the outcome of the encounter. Similarly, the game doesn’t dictate what you do – it’s your choice if you want to move to another location, look for clues, or equip resources. In this way, the game adapts to what you do, making it not just a card game, but a bit of a role-playing game as well. Is it the most romantic or adorable premise? No. Does it give you a chance for you and your partner to work together, and feel absorbed in an engaging world? Yes. 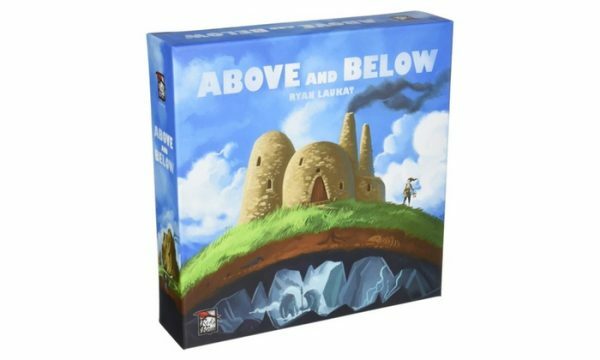 For our final pick, we have Above and Below. Whilst Arkham TCG was cooperative yet eerie, Above and Below is competitive yet…often zen in atmosphere. Well, we’ll admit that the premise itself doesn’t sound too idyllic: your home village was ransacked and destroyed by barbarians, leaving you no choice but to flee for your life. However, things are looking up! You’ve now found a prime spot of land to begin your village anew. Somewhere with opportunities both above ground…and (you guessed it!) below. With this in mind, you and one other player (though this can range up to 4 players in total if you want) compete to try and make your new village the most brilliant and ‘victorious’ of them all, building upon a pastoral ‘above’, and exploring the mysterious caverns below. Even if you’re only playing with two people, Above and Below takes up a lot of space – which feels fitting, since this gives you some expanse to try and build your respective villages on. 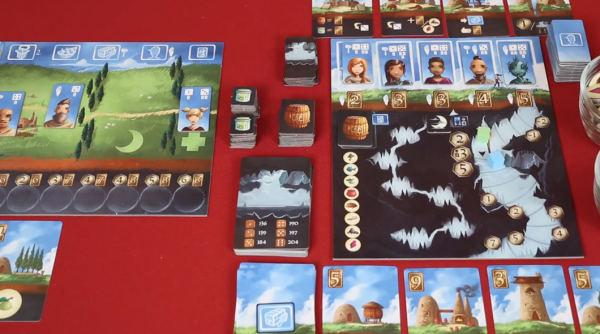 Aside from the central board, each player has their own individual board, where they can build upon their village to grow its capabilities, and move villagers to do different actions. Each turn you can send your villagers to labour, build, harvest, train other villagers, or explore the caverns below you. Each activity has its pros and cons; some will reap higher rewards, providing you with coins or goods you can put on your advancement tracker, but they may also exhaust or even injure your villagers. The most risky but potentially interesting of these actions is exploring the caverns – this is so risky that you can’t send a villager down solo. You have to send a minimum of two. In the caverns, all sorts of things could happen. Depending on your dice roll you’ll be directed to a different excerpt in the adventure booklet that will give you a snippet of story. Perhaps it will turn out you’ve run into a bandit! Or perhaps you’ve discovered some carvings on a wall, in a language you can’t understand. Whatever the scenario, you’ll need to make a choice on what to do, and then roll to see if you’re successful or not. This dice rolling is combined with some strategy (which choice is most likely to be successful, based on the villagers you chose? Is the possible reward worth the higher risk in the long run? ), but it isn’t anything too strenuous. This activity, like all the others, in one way or another effect how many points you end up with. Whoever has the most points by the end of all the rounds wins. Although this is a competitive game, because you and your opponent are building in parallel (you’re literally building on separate boards!) there’s less of the aggression you may feel in other more directly competitive games. Whilst you’re still trying to come out on top, this is more to do with doing the best for yourself than trying to bring the other player down. So, for a game where you can still come out with a clear ‘winner’, but with less of the in-your-face smugness that can come from tenser games, we present Above and Below*. *Don’t worry, you can still be smug about Above and Below if you really, really want. This marks the end of our list! If you want to keep up with more games recommendations, news, and offers on our own game (Beasts of Balance), make sure to sign up to our mailing list below.